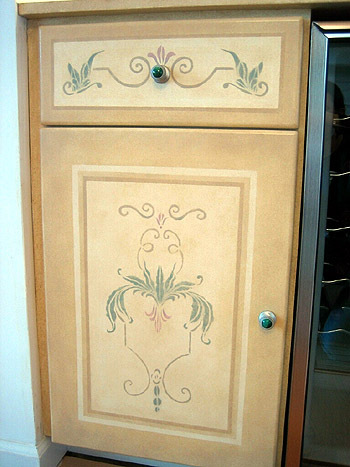 Ornately painted Italian period furniture inspired the paint and glaze treatments applied to this built-in wine cabinet. Layers of stippled glaze, shadowed borders, and custom designed stencils are combined to create an effect that aspires to be fresh and clean, yet reminiscent of a vanished world. Los Altos, Ca. To see another view of this project, click link below.